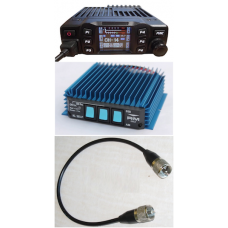 Compact Transceiver 10m Mobile, AM/FM, 4 Watts, 40W PEP AM, Multi Standards. • Input Voltage: 12/ 24 Volts. • Squelch: Manual or Automatic (ASQ). • Roger Beep: 8 Settings. • RF Gain: Off / Auto + 10 Attenuation Levels. • CTCSS / DCS (encoder/decoder): 38 CTCSS / 104 DCS : Sub-Audio code to activate repeater like selective tone. • DTMF (encoder): Tones selected to activate repeater, internet gateway and other items. • Scan Function: Automatic Search of Busy Channels. ... Direct access to channel 9/19 + usual norm can be select by menu + Volume Control + SWR test function + auto power on. • 6 Functions keys PF1 to PF6 with 3 Functions each. • Menu order can be personalized. • Size: 122 (W) x 165 (L) x 35 (H) mm. Antenna SWR required for this amplifier is 1.5:1 or lower. 1.5 ft RG58 Coax Cable with PL 259 connectors - High Quality Cable!